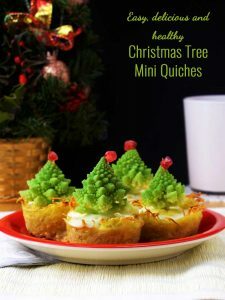 Christmas tree mini quiches recipe is easy, delicious and healthy! 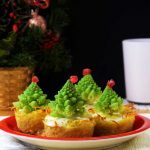 These potato-based fluffy mini quiches will make an impressive appetizer for your holiday table! 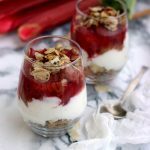 This recipe was developed and written by Marie from The FoodOlic, who is a new guest blogger on my blog! Her work is amazing! Check her bio and her fabulous Christmas tree mini quiches recipe below! I’m Marie, a.k.a. 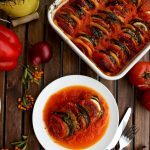 The FoodOlic, a new food blogger currently living in Spain. I’m originally from Canada, Quebec. I’ve also been living in Peru, Colombia and Germany. Let’s say I’m a bit of a traveller… Just like Elena, I’m an expat married to a German, whom I’ve met in Panama 10 years ago. Making this inter-cultural / expat / travel life of mine a great asset to my food knowledge and love. 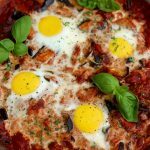 I’ve been living in Barcelona for 6 years now, and enrolled in a culinary school called Hoffman, where I’ve learned the basics of professional cooking and the Spanish/Catalan gastronomy. Although, I’ve rapidly realised that I wasn’t made to work late at night and reproduce every single day the same recipes. 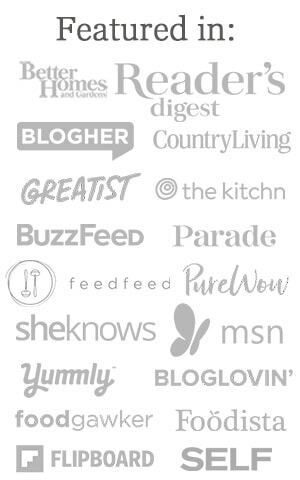 Plus, I needed a way to release all that creativity so… back in March I’ve launched The FoodOlic Blog. 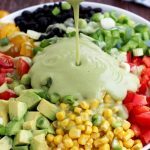 My blog’s style is similar to Elena’s: It’s focused mainly on healthy, lots of veggies and creative recipes. 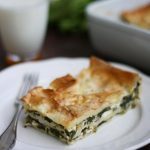 The recipes are mostly Mediterranean, although there are also some nice recipes that I brought back with me from the many places I’ve visited. 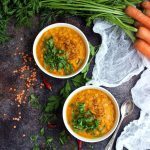 The recipe I share with you here is a good representation of what I do on The FoodOlic blog; yummy, healthy and creative. Don’t they look simply irresistible? 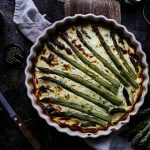 Aren’t those quiches perfect for holiday season? 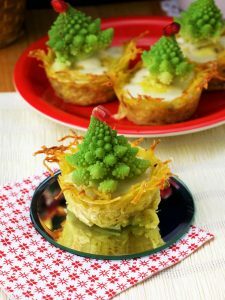 I had the idea for those little mini quiches when I’ve found myself in front of that strange looking veggie I’ve always wondered about; the Romanesco Broccoli. I thought its florets looked like little pine trees. Plus, Christmas is coming, so I had to find a way to make those little pine trees shine. 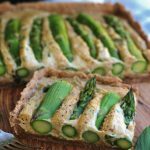 The mini quiches are not only visually irresistible; they are airy, delicious and so easy to make. 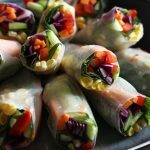 They are a perfect snack or breakfast for the whole family. The base is a potato bed, similar to a rösti or hash browns. Simply need to grate the peeled potatoes, squeeze out all the residual water, add a touch of flour and oil and that’s it! All there is left to do is whisk the eggs and fill up the half way cooked potato cups. 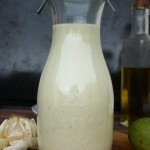 If you want to make the dish gluten free, simply replace the flour by a chickpea flour. To imitate the snow at the bottom of the pine trees, I’ve added a thin layer of fresh goat cheese on top of the eggs. If you are not a fan of goat cheese, just change it for a fresh mozzarella or any cheese you would like, as long as it’s snow white. The last step is the Romanesco Broccoli to make our pine trees. To keep its color vivid I’ve blanched them in boiling water for about 2 minutes, just enough to cook them al dente. Than immediately drained and plunged them into an ice-cold bath. This way our pine trees are going to stay bright green. To make them hold on the quiches, I’ve simply added a toothpick through each floret and let the top exceed a bit to hang the pomegranate grain. Then sticking the other end in the quiches to hold up our Christmas tree. So here it is: nice fluffy healthy holidays mini quiches! 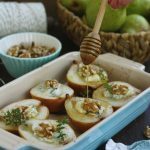 Start by peeling and then grate the potatoes with the help of a fine hole mandolin or a cheese grater , then add the grated potato to a clean towel and squeeze all the juice out. Add the flour, oil, salt and pepper and mix well. Make the potato cups by pressing down the potato mix in a greased or silicone muffin tray . Bake at 180°C (350F) for 15 minutes. During that time, bring a pot of water to boil. 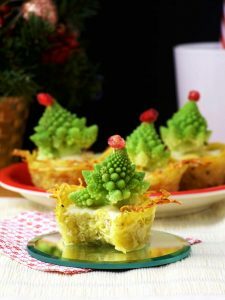 Then cut the romanesco broccoli into small florets (pine trees). Add some salt to the boiling water, then add the florets, let cook for 2 minutes or to your taste. Drain and add immediately to ice cold water to keep them vivid green. Reserve. Whisk the eggs and the milk (if using) in a bowl, add salt and pepper and fill up the half way cooked potato cups. Bake at 180°C (350F) for another 15 minutes. 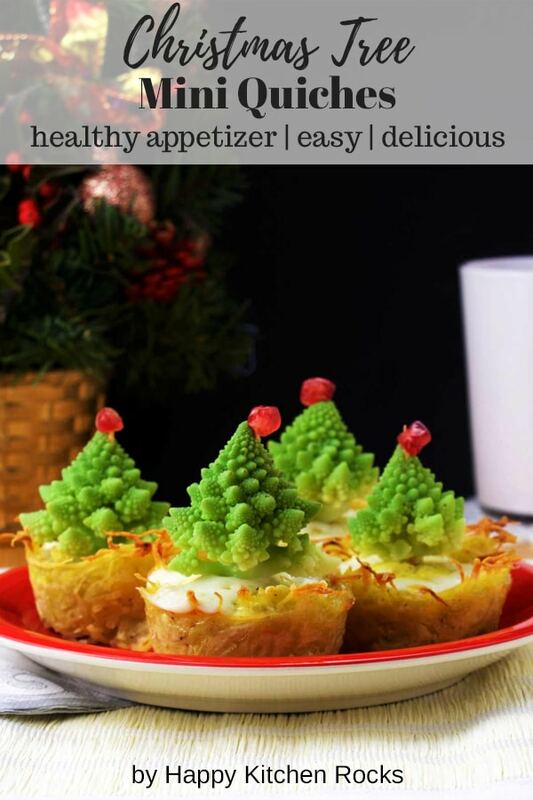 Prepare the pine tree by sticking a tooth pick in the bottom of the Romanesco broccoli, let the tip come out, and top it with a pomegranate grain. Reserve. Add the shredded goat cheese on the quiches 2 minutes before they end cooking, just for the cheese to melt. Take out the quiches, let them cool down for 2 minutes. Take them out from the muffin tray. 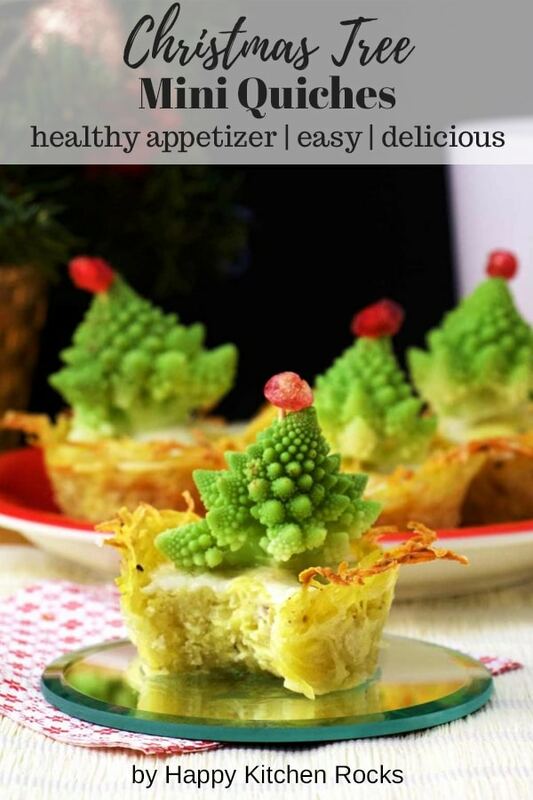 Finish it up by adding the Romanesco broccoli florets (pine trees). Enjoy! I never thought quiche could be cute until now! Quiche has always just been…well….quiche. Until now! The broccoli tree is just so fun! Thank you, Veronika! 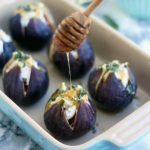 The idea belongs to Marie from The FoodOlic – she is so creative! These are TOOOO cute! 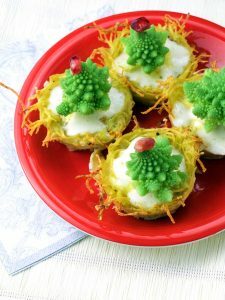 I’ve not seen Romanesco broccoli in my area, but this is such a great idea and so creative! Thank you, Carol! Too bad you can’t get it. 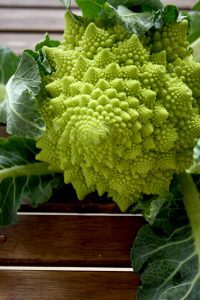 Romanesco broccoli was such a great discovery for us! 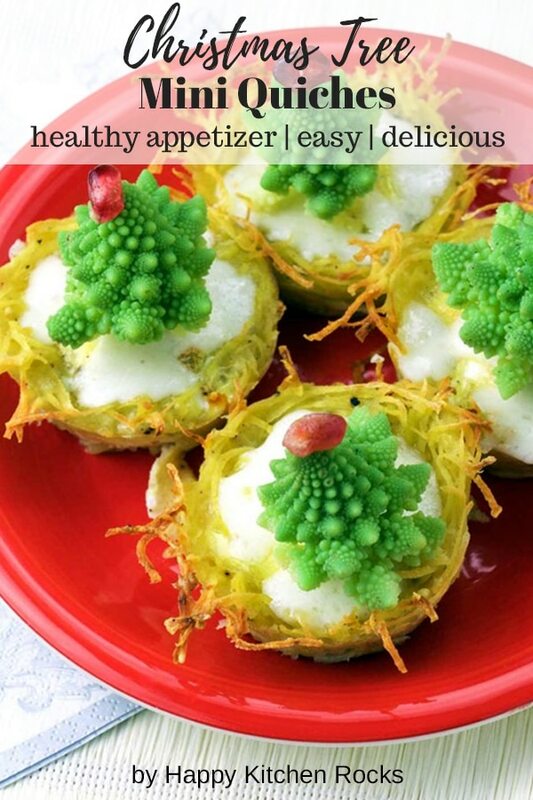 that is the cutest use ever for the broccoli! Love it! Elena- these are perfect for Christmas morning! Thank you, Michelle! Happy holidays to you too! Romanesco broccoli are my favorite! We eat a lot of those in Italy, and mostly in Rome, where I’m from. The florets make a pretty tree appetizer, here, on top of a cute mini quiche! Great! So glad you like these! It’s not easy to find the Romanesco broccoli here in Germany outside of the season, but luckily now it’s finally available for a short time! Such a cute idea for Christmas! I don’t know that I’ve ever had that kind of broccoli though. Aren’t they just adorable? I agree, it’s not you usual broccoli but I’m sure you can find it on farmers markets!